At a private ceremony on 2 October, Art School alumnus Neave Brown was awarded the 2018 Royal Gold Medal, the UK’s highest honour for architecture. Given in recognition of a lifetime’s work, the Royal Gold Medal is approved personally by Her Majesty The Queen and is given to a person or group of people who have had a significant influence ‘either directly or indirectly on the advancement of architecture’. Neave Brown, the revered Modernist architect, is perhaps best known for his visionary 1970s Alexandra Road estate near Swiss Cottage built by Camden Council. With its striking stepped concrete terraces and spacious flats, not only does it provide 500 homes but in Neave’s own words, it’s “a piece of city”, containing shops, workshops, a community centre, special needs school, children’s centre, a care home for young people with learning difficulties and a 16,000sq m public park. Brown believes every home should have its own front door opening directly on to a network of routes and streets that make up a city, as well as its own private external space, open to the sky in the form of a roof garden or terrace. Each of these qualities was incorporated by Brown at Alexandra Road. 22-32 Winscombe Street in Dartmouth Park, north London (1965), a row of 5 terraced homes, designed as a private co-housing project for Brown and his friends. Winscombe Street was financially backed by the London Borough of Camden, as a prototype for the much larger public housing schemes Brown went on to design when he joined Camden Council’s architects department. These hugely influential ‘upside-down’ houses placed the living space upstairs to maximise light, with self-contained, flexible rooms on the ground floor with direct access to private gardens. Brown lived in Winscombe Street for 40 years before moving to Fleet Road, another of his schemes. Dunboyne Road estate (Fleet Road), near Gospel Oak, north London (1975), consists of 71 maisonettes and flats, a shop and studio built for the London Borough of Camden. Fleet Road was the UK’s first high density low-rise scheme; here Brown reinvented the traditional Victorian London terrace as two and three-storey blocks that run in parallel rows with a central pedestrian walkway. Care was taken to preserve its scale and intimacy, and to create light-filled homes, each with their own private terrace and a shared garden. “All my work! I got it just by flying blind, I seem to have been flying all my life. 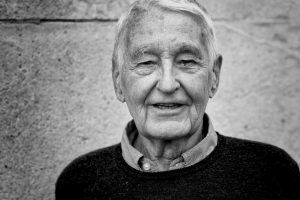 “I’m delighted to announce Neave Brown will receive the 2018 Royal Gold Medal. Neave’s contribution to the development of modern British housing is profound, inspiring to architects, local authorities and those who have benefitted from living in one of his outstanding projects. “His pioneering ideas firmly placed the community at the heart of each of his developments, giving residents shared gardens, their own front door, innovative flexible living spaces and private outside space for every home. “At his Alexandra Road and Fleet Road estates, he showed how to achieve successful high density housing without high rise. The tallest part of the Alexandra Road is just 8 floors, dropping to 4 at its lowest point – yet 520 spacious and sought after homes were provided on this exemplar scheme.